Home » Education » Plant-Based Protein Powders…REVIEWED! We tried most of the best Plant-Based Protein Powders to bring you this extensive Vegan Protein Powder review. You’ll be able to choose your favorite based on taste, ingredients, and price. We make a conscientious effort to reduce the level of meat and dairy products we consume to help keep our gut flora and digestion in check, so plant-based proteins make their way into our diets on a daily basis. We do still use dairy proteins as a vital part of our diet, so check out our review of dairy proteins here. Previously, we discussed why you need protein and how you should choose the right protein for your needs in our Clean Protein Powders 101 post, so please check that out for some basic information. The downside to moving to plant-based protein sources is the higher cost, but as the saying goes, “you get what you pay for,” right? The products we’ve reviewed below should help give you a nice range of products from budget-friendly to ultra-clean. We’ve tried several different plant-based (vegan) protein powders, so we hope you can learn from our failures to narrow down which product is right for you. Below are a few of our favorites. This was originally published on October 15, 2013, and updated January 14, 2019. 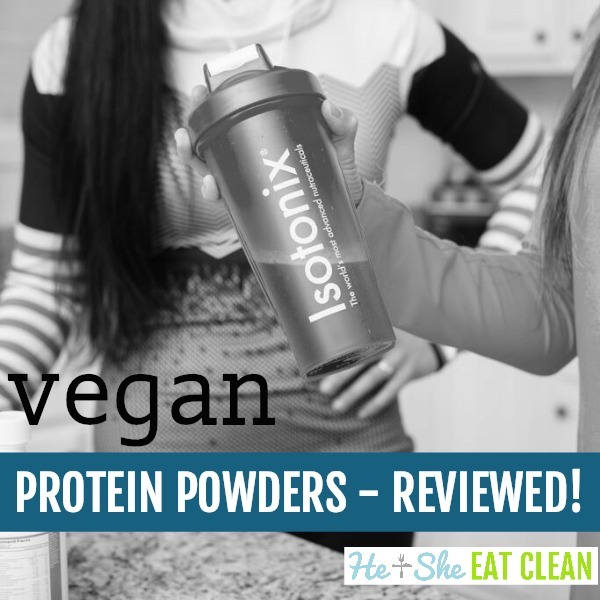 Clean Eating Plant-Based Protein Powders…REVIEWED! Pros – great taste and mixes better than most plant-based protein powders on the market (especially if you want to use plant-based milk like almond milk). It’s also great when used in recipes like our chocolate chunk protein bars. Cons – uses “natural flavors” (what’s that?) and xanthan gum which isn’t necessary, in our opinion. Overall – 8.5/10 – Vega Sport is one of the most prevalent plant-based proteins on the market, but we wish it would be a bit more affordable (each serving is about $1.25). There have been some recent reports of heavy metals and other potentially harmful byproducts found in Vega Sports products, but these reports are seemingly unfounded and possibly inaccurate. Having used Vega’s products for years, we have faith and trust in the brand to ensure products are safe for consumption. Pros – lots of flavors to choose from and all are actually pretty tasty! We really appreciate the attention to building a protein powder with mostly organic ingredients. The additional fiber is also a great way to help busy individuals meet their daily needs. Cons – uses “natural flavors” (what’s that?) and multiple types of food-grade gums which aren’t necessary, in our opinion. Overall – 8/10 – I really appreciate Dr. Andrew Abraham’s commitment to clean nutrition with the creation of Orgain products. I also feel as though I can trust this commitment based on Dr. Abraham’s story and brush with cancer…read his story here. Pros – very simple complex of plant proteins – pea, hemp and quinoa with very little unnecessary ingredients. The winner on the cost front – about $0.80 per serving…almost 40% cheaper than the other three powders reviewed. Cons – another product with natural flavors, but we’ve visited NOW SPORTS’ production facility and stand by their product quality, testing, and commitment to excellence which is evidenced by their strict testing internally and by third-parties. Overall – 8/10 – this is the clear winner if you’re on a budget. We LOVE NOW’s products! You’ll see all kinds of NOW supplements, proteins and other food sitting in our pantry…needless to say, we have complete trust and faith in NOW’s product sourcing, production and sales channels. Pros – mostly organic – all protein sources are organic, great taste with added enzymes to help your body break down protein and plenty of fiber to assist with digestion. A little cheaper than Orgain and Vega Sport. Cons – does include sugar, but it’s coconut sugar so it’s a little better from a glycemic index standpoint. Luckily, each serving only includes two grams of sugar…not enough to worry about unless you’re consuming this powder with every meal! Overall – 8.5/10 – with the added ingredients to support digestion, this protein is probably the best if you often experience intestinal discomfort when digesting protein powders (either dairy or plant-based). We wish the sugar wasn’t included, but it’s not enough to warrant avoiding this protein…give it a try! Have you tried other plant-based proteins that you feel should be on this list? If so, please leave a comment below! This is so helpful! I’ve been using Arbonne’s pea protein powder and love it. I’d love your review on that! I’ve tried the Vega Sport Chocolate and find it very grainy. All of the ones I’ve tried are very hard to blend. Any suggestions?